It’s massive -- the largest on the lake -- and around 10 times the size of Kompong Phluk. As with Kompong Phluk, the main livelihood here is fishing, but in a number of ways it is a more interesting village to visit. There’s a large village temple and a good stretch of village can be wandered through, even in the height of the monsoon. 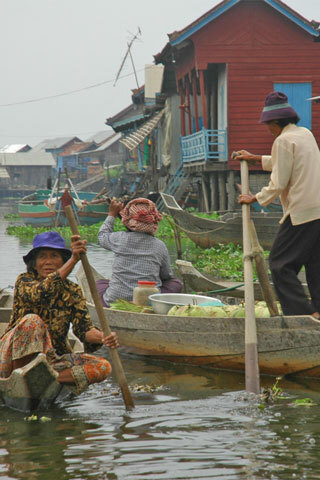 Further afield you can continue by boat out to a meeting tree where locals converge to sell their catches of the day -- or you can continue even further out onto the milky waters of the Tonle Sap. The water within the heart of the village is nine to 10 metres deep in places and is a brackish, almost black hue -- this certainly isn’t water you want to swim in -- but the area all around the central village is fascinating and very unadulterated by tourism. It’s a long drive or ride from Siem Reap to here (figure on 1.5-2.5 hours each way) but well worth the effort and expense. If you’ve got the time and the money, this should be your number one choice on this bank of the lake. While it’s possible to get here by boat from Chong Khneas, we’d suggest coming to and fro by road via the village of Domdek. Expect to pay US$60-80 for a guesthouse tour out of Siem Reap. Highly recommended.